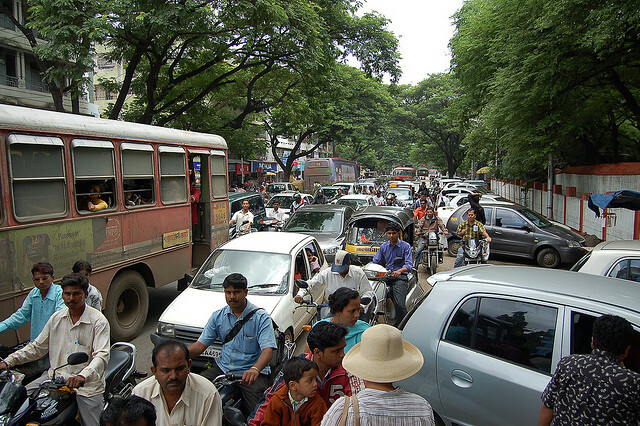 Light-weight vehicle sales in India in 2010 made the country the sixth-largest automobile market in the world. Photo by Ted. More than 2.7 million light vehicles were sold in India in 2010, making it the sixth-largest automotive market in the world, overtaking France, the United Kingdom and Italy. The country of nearly 1.2 billion people is expected to become one of the three largest automotive markets in the world by 2020, according to a special report, “India Automotive 2020: The Next Giant from Asia,” released by J.D. Power and Associates. Cycling in the city of Montreal is safer in bike lanes and bike paths than cycling on streets without bike infrastructure, according to a new study from McGill University, Harvard University and Montreal’s Public Health Department. While calculating cycling risk, the study counted the volume of cyclists traveling on various Montreal streets, uncovering that the average number of daily riders peaks near 5,000 on popular roads. Reactions to the study are dominated by calls for improving Montreal’s bike infrastructure to accommodate cycling’s growing popularity. There are ample resource supplies to support the potential widespread production of EV batteries, according to a study by Lawrence Berkeley National Laboratory and the University of California Berkeley. The study’s research team accessed the availability of elements required for making active materials in five major classes of batteries. Specifically regarding lithium-based EV batteries, roughly 1 billion 40 kWh batteries could be built with the calculated lithium resource supply. Investments in urban public transport improve employment outcomes for residents, indicates a study by the Sustainable Transportation Center at the University of California, Davis. The study investigated approximately 2,000 households in Bogota, Colombia, home of the TransMilenio bus rapid transit (BRT) system. Though not exhibited in households located immediately next to bus stations, households near bus stations (between 750-1500 meters) experienced a statistically significant increase in income resulting from bus system activity. The study’s complete findings hold important considerations for future land use surrounding BRT systems.